CWA Local 1033 is the labor union that represents and advocates on behalf of 5,000 public workers of Mercer County in the state of New Jersey. We are an organized group of workers who unite to make decisions about conditions affecting their work. CWA Local 1033 strives to bring economic justice to the workplace and social justice to our nation. As a union, our objectives are to implement programs that improve the quality of workers’ rights, their wages and the working environments regarding the terms and conditions of their employment. In addition our Union disseminates information for the purpose of uplifting the economic and social conditions of our members. Politically, CWA Local 1033 is instrumental in the support of legislation that seeks to improve the status of the Union as a whole. This agenda is advanced through the enactment of laws that are in the best interest of our membership, our families and our communities. Join CWA Local 1033 as a Full Dues Member by filling out your Membership Card to stand in solidarity with your union Brothers and Sisters as we are STRONGER TOGETHER. Know our rights. Read and familiarize ourselves with our union contract so we know our rights. Contact your Shop Steward if we don’t understand something. 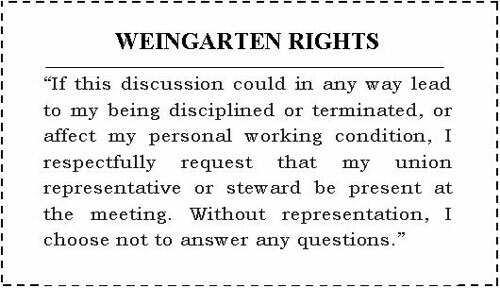 Know what your Weingarten Rights are and when to use them. Insist on fair treatment. If we have a dispute with management, we should let our steward know. CWA may already have addressed the same or similar issue. Help others. When a coworker has a problem with management and needs support, we back them up. Get involved whenever stewards need help in mobilizing. Help maintain our standard of living. During contract negotiations, provide input on issues and participate in mobilization activities to support our bargaining committee. Become a CWA Shop Steward, Committee Member, Activist or Volunteer. We encourage members to join our stewards’ or mobilizers’ network. If interested, please contact us. Fifteen partial college scholarships of $3,000 each are being offered for the 2019-2020 school year. Winners, selected in a lottery drawing, also will receive second-year scholarships of the same amount contingent upon satisfactory academic accomplishment. Part-time students, less than 12 credits, will receive half of the scholarship monies. Eligible for the awards are CWA members and their spouses, children and grandchildren, including those of retired or deceased members. Click here for additional information. Amounts range from $500 to $4,000. These one-time cash awards are for study beginning in the Fall of 2019. Students may re-apply each year. This is a competitive scholarship. Applicants are evaluated according to academic ability, social awareness, financial need and appreciation of labor. A GPA of 3.0 or higher is recommended. The required essays can account for up to half your total score. Scholarship applicants are judged by a committee of impartial post-secondary educators. Eligible for the awards are current and retired members of participating unions, their spouses and their dependent children (as defined by IRS regulations). At least one year of continuous union membership by the applicant, applicant’s spouse or parent (if applicant is a dependent). Click here for additional information. CWA Local 1033 Members now have access to our Legal Services Plan. Members can call the plan providers, Pellettieri, Rabstein & Altman Andrew L. Watson, Esquire 800-432-LAWS (5297) to make an appointment. You must indicate that you are the member, the spouse or the minor child of the 1033 member. Local members throughout the state are eligible for this benefit. CWA LOCAL 1033 pays for and provides this service as a member only benefit. Please contact us with any questions. Click here for detailed information and services provided. Our Members enjoy discount Movie Tickets at AMC Theaters and Regal Cinemas. Members may purchase a maximum of five (5) tickets every two weeks. For your convenience, tickets may be purchased through the mail with a check or money order payable to CWA Local 1033, or at the Local office on Mondays and Fridays, between the hours of 8:00 AM and 5:00 PM with Cash, Check, or Money Order. Click here for Movie Ticket Order Form and complete ticket policy. Ready for some FUN at Pennsylvania’s premier amusement & water park? Enjoy exclusive savings on admission tickets to Dorney Park & Wildwater Kingdom as a valued member of CWA 1033! CWA Local 1033 Members enjoy special savings that will always provide the best savings on tickets! Call the local for latest promotions and special officers. The official training site for CWA members, and your best source for professional grade courses that will help keep your career on track. Create a Login today and get free access for you and your family to Lynda.com and Focus On You! Click here to begin building a better you! Money saving benefits for union members with Union Plus. Using the collective purchasing power of millions of union members, Union Plus offers you a wide range of high quality benefits with great value. Union Plus programs deliver the quality, service and savings your family deserves. Click here for more information. Click here for more information on AAA South Jersey.